Over the last 10 years, we have seen a sharp increase in the growth of the blow dry bar — a quick in, quick out, no-appointment-necessary option for super sleek hair at an affordable price. Salons like The Dry Bar, Cloud 10 Blowdry Bar and Makeup Salon, Air Blow Dry Bar and Salon, and AirBar have been featured in Salon Today, touting this affordable new luxury. One thing was absent from all these endeavors — nail services. These bars capitalize on doing a single thing really well — hair — and making it affordable. It became the new shampoo set, the new weekly salon visit to escape a hectic life, the new “I deserve it” service. With no appointment needed, a gal can stop in during her lunch break or while the kids are at daycare. The locations are tailored to the escape, with girly themes, streamlined menus, and snacks. Some stream “chick flicks” on wide-screen TVs and serve alcoholic refreshments. They offer a pick-me-up during a tough week or a way to celebrate. Women gratefully embraced the concept and the trend grew rapidly since its introduction, mostly through chain and franchise activity. Like the fast food chains, the model could be replicated over and over again and clients knew what to expect. Women loved it and couldn’t get enough of it. Over the last few years, some nail salons have been incorporating the blow dry concept into their offerings, with mixed results. Those making it work are guarding their success like the secret formula of Coca Cola. From the outside, we can see what they are offering, but some of the mechanics of how they keep the machine oiled are protected behind closed doors and not many are talking. One thing that stands out is that the big players are franchising, taking advantage of the power of branding in a move toward omnipresence. Blo has more than 60 locations across the U.S., U.K., and the Philippines, and many contain a beauty bar dedicated to nails. While quiet on operations, they were quick to share that franchise opportunities are available. 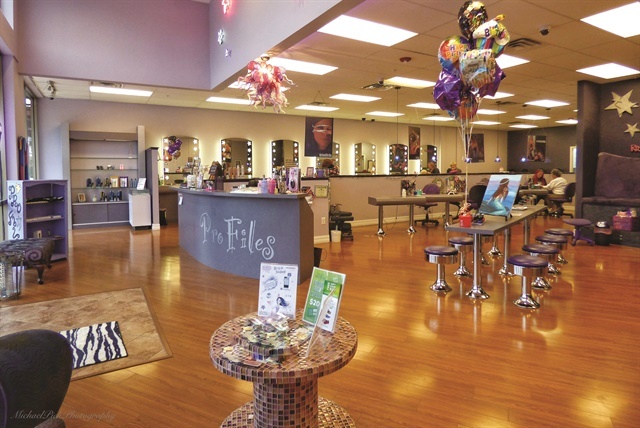 Profiles Salon in Fort Myers, Fla., is one of the salons embracing the blow dry bar/nail bar relationship. Debbie Montiel, the owner of this location of the franchise, shares that she is part of a network of five salons with more than 75 employees. Her location jumped on the blow dry bandwagon three years ago. She is busy and her location is hiring. She followed the trend after a client told her it was “becoming a big hit on the West Coast.” Since the salon was already licensed as a full-service salon, no additional licenses or equipment changes were needed. Her salon has a standard blow dry bar offering for $32. Montiel does a lot of networking in the area to build the salon’s reputation and emphasize options. A client can come in for a blowout and take advantage of the newest acrylic nail colors, gels, and an ever-changing inventory of retail choices. The atmosphere is fun. Wine, chocolate, coffee, and water are served in the midst of a glittery, purple, zebra-adorned paradise. So far, competition from similar salons has not been an issue. Whenever a new trend or service appears on the salon scene, salon owners are quick to assess the profitability and feasibility of adding it to their menus. One of the most important questions a salon owner can ask is, “Am I looking for a lifeline to save the salon?” Are you merely looking to open up options or is there something bigger at play? One of the pros of the blow dry bar craze is being really good at delivering a signature service, over and over again, and being profitable while doing it. If a salon has deficiencies that are currently hurting profitability, then remedying those before adding more layers to manage may be the better first step. The lesson from those who have made it seems to be this: Be really good at what you do, and do THAT thing. The second question is whether to go it alone or consider a franchise relationship. Realistically, franchising has benefits in that someone else has made some of the mistakes and found what works. You pay for that experience up front and in ongoing royalties. Another benefit of franchising is the brand recognition and marketing support. Most franchises will have minimum requirements for owners — for example, Torrance, Calif.-based Blodry Bar Inc. requires that candidates experience all services at least twice in the last three months, have a minimum net worth of $500,000, and have a minimum $300,000 combined cash and line of credit for a single location. Obviously, they only want serious applicants who can bankroll the buildouts needed to keep the brand consistent and ensure it can survive during the “getting established” period. The salon industry is strong. According to the U.S. Bureau of Labor Statistics, projected job growth through 2022 is 13% for cosmetologists and 11% for barbers. The salon and spa industry outperformed the overall private sector during the last recession, and according to the American Association of Cosmetology Schools, it is attracting women, minorities, and those looking for new career opportunities. Cosmetology and barber schools are a growing industry — so a steady supply of staff members shouldn’t be a problem. Adding the services may require relocation or a large build-out — after all, part of the allure of the blow dry concept is that it doesn’t feel like a salon, so merely putting a chair in the corner isn’t going to cut it. To attract blowout clients, a new ventilation system may need to be installed to control the odors associated with some nail services. And there is the issue of serving alcohol. Not all states allow alcohol in the salon and many require a special license to serve — whether the salon charges for it or not. So many questions and things to consider; it’s not as cut and dried as choosing a new retail line to carry. Today’s beauty scene is a far cry from your grandmother’s salon. Shampoo sets and water manicures have given way to blowouts, gel nails, and nail art. Every salon owner who adds a service and every client who embraces it influences the industry trends. Every few years a product or service stands to disrupt the industry, in a good way, and it looks like the blow dry bar trend is doing just that.